Great weather today for the park style comp. Mt Bandai was visible all day long, beautiful mountains, plus the view of the lake were fantastic. No wind either, so I think we were really lucky today! Check out the amazing snowmobile that I found, called the Sherpa! I want one of those to drive from my house to the 7/11 when I need to buy some snacks. 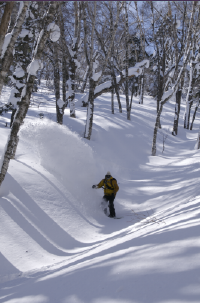 Legend in snowboard photography in Japan, respect Takiguchi! Japanese high tech style with the P2 32 gig card and external hard drive for a total of way over 10 grand! Tani-san respect. Love the dramatic trees here at Alts Bandai. I think this is Kokubo Kazu going huge on the hip during the finals! Here is todays winner Mikkel Bang from Norway! Switch backside 1080 on the jump and a perfect front side 360 on the hip going super big! The young guys put on an amazing performance today and the crowd got a really good show. Nice to be able to watch a contest in sunny weather for a change! First time in about 5 years that I have enjoyed a contest this much! Keeping my fingers crossed for more good weather tomorrow! 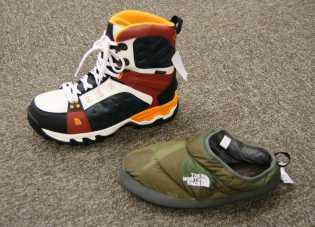 Went to a special preview of 2008/2009 fall winter North Face gear here in Sapporo yesterday. found a few items I am interested in. First lets take a look at the shoes. I like these boots and the cool down slip on shoes. The slip on shoes have a pretty good sole so you can walk around outside as well as use them inside. It’s a perfect item for those long winter drives to the mountains. Next check out the mega gloves! 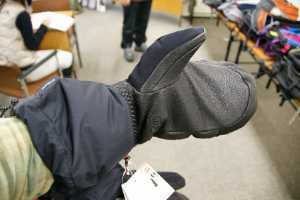 A must have item for the camera people out there or anyone who has a problem with cold hands. These are down mittens, with 800 fill. Basically a sleeping bag for your hands. I like to use thin five-fingered gloves for handling the camera and then put on mittens while waiting to keep warm. 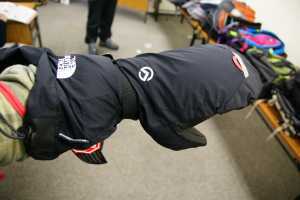 This year I am using Black Diamond gloves, but will test out these North Face gloves next year. Also met up with the Kawada sisters at the North Face show. They were checking out some new flight series backpacks and hats. The RTG line also looked good. 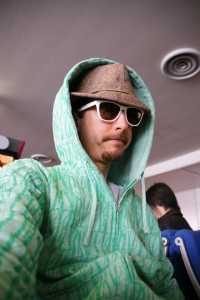 I like the style and color of this jacket. There certainly is going to be a lot of retro stuff coming out next winter from all the different brands. and I also like this new organic cotton sweatshirt with the cool bamboo style print. It’s nice to be able to promote some earth friendly items from my favorite brands. So I have been trying to get to the Nippon Open contest in Fukushima prefecture since yesterday. 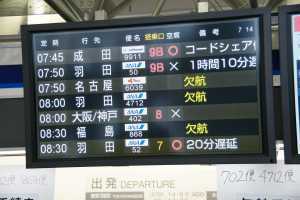 This always seems to happen when I leave Hokkaido for a contest. Every year the biggest storm of the season arrives just as I am leaving. All my friends and crew are getting in some powder runs, while I am sitting on an airplane kicking myself. Well this year is no different. A huge storm hits as I pack my bags and make my way to the airport. 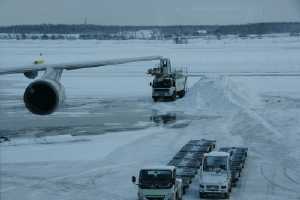 Then I sit on a plane on the runway for three hours, while we wait to take off. The plane in front of us apparently ran off the runway (because he didn’t know the way) and we had to sit there while they checked the plane for damage. In the end, we ran out of time and had to go back to the gate. At that point there were no more gates available, so they dropped us off way out in the middle of nowhere for a bus ride back to the airport. Had to get a hotel in Chitose near the airport. Up early this morning for a 6:30 shuttle bus back to the airport to find out that my 8:30 am flight was now cancelled! Great start to day two. So now I am rebooked on a flight to Tokyo, which means I will have to drag my bags through three train stations a bullet train ride and a bus and a taxi ride to get to the event. Lucky for me the event is canceled for the day due to bad weather, so I don`t actually miss out on any work. By the way I am going to the Nippon Open to act as the host and interviewer for the J-Sport/ESPN broadcast for the event. I’ll be keeping you posted on the action throughout the weekend! Masa and Tamai Taro (owner of Gentem Stick) for a private heli session one day after the North Face tour. So of course I had to ask if I could join this legendary session. What a great opportunity to shoot and ride with two of Japans legends and get to watch the making of the new Icon movie. 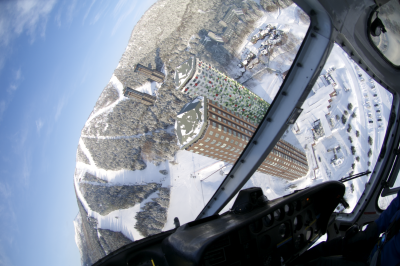 We did a total of four runs with the heli, the weather was good, but the wind was really strong. We had planned to do some follow shots from the heli, but that got canceled due to the high winds. The first run of the day was incredible light, perfect blue sky and the sun backlit through the trees. I decided to use some fuji provia film to capture that moment so you will have to wait to see those photos. Here are a couple of the digi shots from the day.Tamai Taro going full speed into a front side turn. The heli and the cat! If only every day could be like this! Thanks to “Kenya-san” for the great day and invitation to join the shooting, I had a really good time! Second day of heli tour in Tomamu the weather cleared and yes we were able to fly! 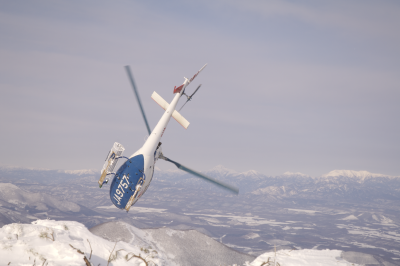 The tour customers were stoked to be able to get in the helicopter and we had great conditions all day. The higher sections of the mountain were rather wind blown and hard, but as soon as we rode lower into the bowls and tree sections the powder was good. I think we may have had the best conditions on the north island on Sunday. 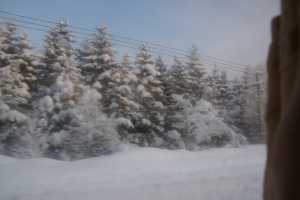 I hear that a lot of the resorts on the west side were all hard packed and icy from the strong winds. A big thank you to our amazing pilot! This guy was the best pilot I have had the pleasure of flying with. Amazing style and he really played it up for the cameras with some cool manuevers. I have to say it was probably one of the coldest days I have ever spent in the mountians….. it was freezing up there near the peak. Minus 20 all day long as the camera crew stood around waiting for the customers to ride by. I thought my hands would get frost bite for sure…. Thanks again to The North Face and Masa Takeuchi for a great weekend, and I look forward to this trip again next year. Make sure to put in your reservations early as this tour is sold out way in advance. Now check out this final shot from the heli on our way back to the heliport. The pilot did a low pass around the Tomamu towers, better than the best roller coaster ride. I am sure the people in the towers were freaking out thinking we would crash into somebody’s room! 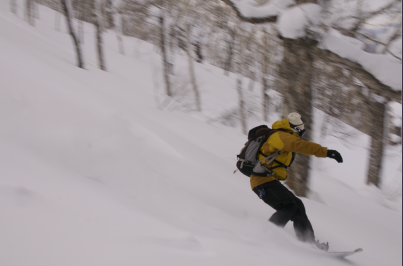 Last night I said goodbye to the Volcom crew near Furano and made the 2 hour drive to Tomamu to join the North Face crew lead by Masa Takeuchi for two days of Heli boarding. Was sad to say goodbye to the Volcom crew, we had a great week shooting around Hokkaido and I think the guys really enjoyed the tour. 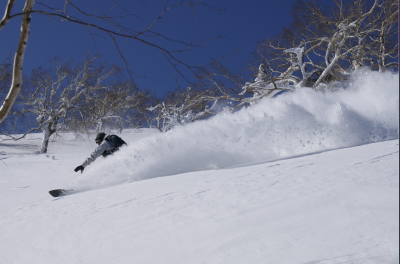 We ended with a super jump session in the Tokachi backcountry. 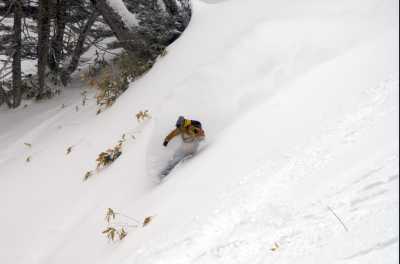 Was fun to shoot the guys launching into the soft powder landing. Look for the full story on the trip sometime in the fall of this year. Trans-World Japan will be printing the story in the October or November issue! So today in Tomamu awoke to bad weather. A storm has moved in over the island and Tomamu is getting snow and wind. This made for white out conditions and the pilot decided that it would be impossible to fly today… To bad as everyone was really looking forward to the heli. We made a visit to the heliport for a briefing and then headed straight to the Cat service for a day of riding. The snow was still a little thin, but we had a great time riding around and shooting photos with everyone. 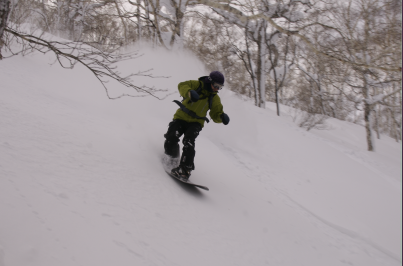 Masa was on point as usual riding next years Burton Fish board, perfect for the terrain here in Tomamu. Tomorrow we have one more chance for the heli riding, hoping that the weather blows through tonight and we have blue skys tomorrow! The Volcom crew piled into the cars last night and we all drove out to Tokachi area to the east about a three hour drive. We stopped at “Donqiute” the mega store and the boys picked up a bunch of good items like, Ninja suits and air guns. Little did I know that we would soon be involved in a massive gun battle. We arrived at our hotel to find another crew there celebrating their last day of filming in the area. The crew happened to be a Red Bull film crew including none other than Shaun White, Zach Leach, Pat Moore, Heikki Sorsa, and a bunch of camera people and staff. They were wasted drunk and having dinner. It turns out they all had air guns as well and the minute we walked in the guns started blazing. We sat down to the wildest dinner ever, a massive gun battle while we tried to eat. I got hit in the chest once and it certainly stung! I shot a lot of photos of the world famous snowboarders going crazy, but have not had a chance to get them into the computer. Will have a full update soon. Presently just snaking the internet at the Prince Hotel in Furano. It is snowing hard here now, by the way. 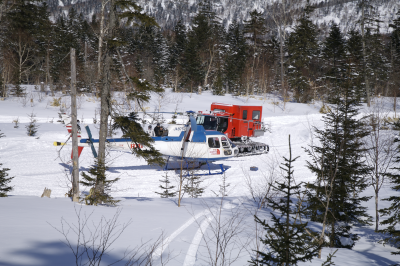 Tomorrow is our last day filming, will move on to Tomamu for the North Face heli boarding shoot after that. More coming to you later.